It’s the start of summer and people are getting outside, enjoying the wilderness. That means for doctors who treat Lyme disease, this is their busy season. Around 300,000 people contract the tick borne disease every year. Nearly 95 percent of cases are found in 14 states in the Northeast and Upper Midwest. For many people, treatment with an anti-biotic is effective. But for others, symptoms can persist, a controversial topic in the medical community. 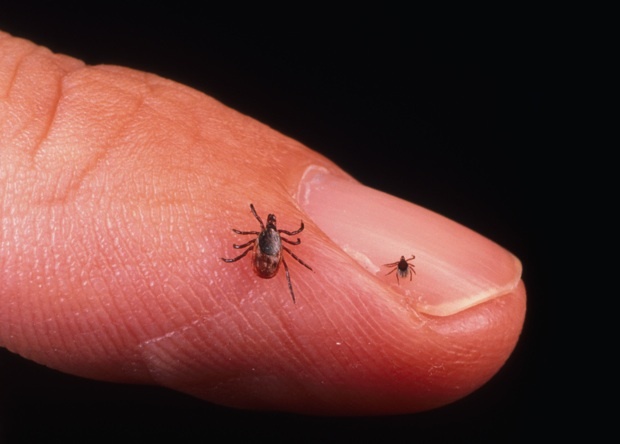 We discuss what you should know about contracting, diagnosing and treating Lyme disease. Paul Roepe Co-director, the Center for Infectious Disease at Georgetown University; professor of biochemistry and cellular and molecular biology at the Georgetown University Medical Center. Dr. Neil Spector Author, "Gone In A Heartbeat: A Physician's Search For True Healing". He is associate professor for the departments of medicine and pharmacology and cancer biology at the Duke University School of Medicine. Around 300,000 people contract Lyme Disease every year. Yet diagnosing and treating the tick borne disease continues to challenge many physicians. We got some advice. MS. DIANE REHMThanks for joining us. I'm Diane Rehm. In the early 1970s, a group of children in Lyme, Connecticut, came down with arthritis after playing by the river. About a decade later, the link between deer ticks and Lyme disease was discovered. Today, some 300,000 cases are reported every year. Here to discuss diagnosing and treating Lyme disease, Dr. John Aucott of the Lyme Disease Clinical Research Center at the Johns Hopkins Bayview Medical Center. Paul Roepe of Georgetown University. Joining us from New York City, Dr. Sunil Sood of Southside Hospital in Bay Shore, New York. MS. DIANE REHMI'm sure many of you will want to join the conversation. Give us a call at 800-433-8850. Send an email to drshow@wamu.org. Follow us on Facebook or send us a tweet. And thank you for being with us. DR. JOHN AUCOTTGreat to be here. DR. PAUL ROEPEGreat to be here, Diane. DR. SUNIL SOODThank you, Diane. REHMDr. Roepe, I'll start with you. Give us a sense of exactly what Lyme disease is. ROEPESo Lyme disease is an infectious disease that's cause by a bite from a tick that -- there are multiple species of ticks that can carry Lyme disease, but the genus is ixodes so ixodes ticks carry all sorts of microorganisms, but the one that's responsible for Lyme disease in this country is a bacterium called Borrelia burgdorferi. There are other species of Borrelia so in Europe, there are two other species that are more common than burgdorferi and there's others in Australia and so on. ROEPESo depending on where you are in the globe, you can get Lyme disease from one or more bacteria in the Borrelia genus that get into your body through the bite of a tick. REHMWhat does this tick look like? ROEPEThey're really hard to see sometimes. The tick has a complicated life cycle that goes through -- some people refer to them as deer ticks because later in their life, usually in the fall and in the winter, they're living on deer blood. And at that stage, they're adults. They're mature adults. But in the spring and the summer, they're nymphs so they're very, very tiny. ROEPEThey're really, really hard to see and they're often missed. This is one of the problems with diagnosing Lyme disease. REHMDr. Aucott, we've said that the east and the upper Midwest are the two places where these ticks are concentrated. Why is that? AUCOTTWell, I would add also the San Francisco Bay area as well on the West coast and it's because those were the residual pockets of ticks that persisted after the demise of, you know, deer almost became extinct and the habitat for ticks was lost in the 1900s and they recurred then as the deer populations expanded from these foci, one around Lyme, Connecticut, one up in Minnesota and one up in the upper northwest of California. AUCOTTSo those foci, then were the residual pockets of ticks and Borrelia and then they've expanded out as the habitat now, of course, is everywhere around us. REHMTell us the story of what happened in Lyme, Connecticut. AUCOTTWell, there was an outbreak -- a focal outbreak of what was through at the time to be juvenile rheumatoid arthritis. In retrospect, it was actually what's not called late Lyme arthritis, but at the time was thought to be not related to an infection. But a very astute mother that lived on the street realized there were multiple cases of juvenile rheumatoid arthritis on her street. And she looked it up in the encyclopedia at that time and the incidence was so low that the odds of having multiple cases all on one street was, you know, a one in 10 million. AUCOTTAnd she went to the public health department with this astute observation and said, there's something going on here. This is not a coincidence that all these cases of "juvenile rheumatoid arthritis" have occurred on the block of my street. REHMSo was it that surrounding the lake were woods where deer were in habitat? AUCOTTYeah, so the kids were playing in the habitat. AUCOTTThey were actually getting tick bites and not knowing, at that time, they were getting the telltale skin lesion, the round red skin lesion, but it was being attributed just to a bug bite. And even without treatment, that skin lesion goes away and then, in the case of the kids, the association of those bug bites was not made with the later arthritis because they're separated in time by many months. REHMDr. Roepe, what's different about Lyme disease in this country from what we see in other areas of the world? ROEPEThere are a lot of similarities, but there are some differences. Like I said, the species of Borrelia bacteria -- so these are spirochetes and there's not as much basic research on the different species as you might think, but there are some reports in the literature with regard to the severity of the disease and how early the symptoms are manifested. ROEPE...versus other factors like the genetic makeup of the person that's been infected with the Borrelia, but there may be some differences. REHMAnd turning to you, Dr. Sood, if a patient comes to you finding a tick on them, what's the initial or immediate course of treatment? SOODSo I do want to emphasize that people get very concerned, almost panicked if they find a tick on their child or pull a tick off the child or themselves. So the first thing to do is don't panic. Most people do not even get any kind of infection from a tick bite. The overall rate of infection from tick bites even in the endemic areas that you -- were listed at the beginning of the show, is low. It's probably less than 5 percent. SOODAnd the other thing to keep in mind, it's very important to not get angry and flush the tick down the toilet or crush it and throw it away and then call your doctor. No. First, save the tick, pull the tick off because there's three types of ticks we actually see, especially in the northeast, and there's about eight or nine different types of tick borne infections that we have to keep in mind when looking for symptoms in the following days or weeks. SOODSo save the tick, have it identified by the lab. Most labs will identify the tick. REHMWait a minute. I want to stop you right there. What is the best way to save the tick? SOODRight. So the first -- the best way to pull it off is to use a simple tin-tipped pair of tweezers, pulling straight up if you can identify the head of the tick and sort of, you know, gently yank it out. And then, place it any empty medicine container, you know, any empty pill bottle and bring it to your doctor and ask if it can be sent to the lab for identification. We do not recommend that the tick be "tested for Lyme disease" which is a test which is available in labs. That doesn't give us any information. SOODWe do want to know what kind of tick it is. Dr. Roepe mentioned the ixodes or deer tick, but we also see a lot of lone star ticks and we see a lot of dog ticks. And so we do not recommend immediate treatment with antibiotics to your first question or even immediate blood tests. It's kind of a watch, wait and treat approach and any symptoms that occur can be generally easily recognized. Now that you know you had a tick bite, you can watch the area where the tick was attached and report any rash or other symptoms. REHMNow, Dr. Sood, I want to follow up on that because, perhaps erroneously, my understanding has been that if in doubt, treat with antibiotics. And you're saying no to that. SOODYes. So I think all the experts and organizations that develop guidelines for tick borne infections say the same thing, that is you would be treating, you know, 99 children for that one case that you possibly could prevent. The other important thing to keep in mind is that if you pull the tick off within really two days, it is very unlikely because the experiments and a study in humans has shown that it really takes 48 to 72 hours for this ixodes tick to transmit the infection so you have time and so we would not treat everybody. REHMAll right. Now, let me put it in another way. Suppose one experiences a tick bite without even really knowing it, but does see that circular marking indicative of a Lyme tick bite. What would you say, Dr. Aucott? AUCOTTSo I think the distinction needs to be made between prophylaxis at the time of tick removal and treatment, usually 7 to 10 days later after the tick bite. Treatment with the round red skin lesion, that is a clinical diagnosis based on the visible skin lesion, that's treatment that usually occurs 10 days or two weeks after the tick bite and that's different than prophylaxis with antibiotics at the time of the tick bite. REHMSo how often would you treat prophylactically? AUCOTTSo I actually don't recommend prophylaxis. AUCOTTBecause I'm worried that I might be also -- remember, if you have one tick bite, maybe you got a tick bite three days before that you didn't see. In fact, most cases of Lyme disease people do not report a tick bite. So I'm worried if I give a single dose -- because the current recommendations for prophylaxis or a single dose of doxycycline, I'm worried if I do that, I actually might be under-treating an established case that started 4 days or a week before that I don't know where that tick bite was. AUCOTTSo I would rather know what I'm treating and not prophylax a tick bite. REHMOkay. We're going to take a short break here, but I want to know, when we come back, what the seriousness of a -- of Lyme disease actually might be and whether it might be better to treat prophylactically to avoid that kind of serious problem. Short break. We'll be right back. REHMWelcome back. I want to let you know that Dr. John Aucott from the John Hopkins Bayview Medical Center is going to stay on after our program is over to answer your questions about Lyme disease in a live Facebook Q&A. You can post questions at facebook.com/thedianerehmshow, and we'll get started with that conversation at noon Eastern. REHMIn the meantime, Dr. Roepe, can you describe for us symptoms, say, that one has been bitten by a particular kind of tick and I gather begins to develop symptoms? What are those symptoms, and how does the patient feel? ROEPESure, so in about 75 percent, maybe 80 percent, of the cases, the first symptom is going to be the characteristic bull's-eye rash. You're not going to feel under the weather or anything, but you may notice the characteristic bull's-eye rash, which as we heard earlier is now considered by the CDC to be a diagnosis of Lyme disease. REHMAnd how soon does that show up? ROEPEYeah, and that's one of the problems with this disease because it can show up within a couple days, or it can take a couple weeks and sometimes even longer. REHMDr. Sood, do you want to add to that? SOODMaybe I can add a perspective from an excellent prospective study that was done in children. Actually the author is from Yale and University of Connecticut Children's Hospital, looked at about 200 children and actually reminded us that 90 percent, at least in that group of children seen in five pediatric practices, 90 percent of them had a rash because they were looking for the rash. That includes a single erythema migrans, which is that ring-like rash, or multiple rings in the body. SOODAnd then only a handful of them actually had what used to be called the second stage of the illness, where it can actually spread to the nervous system, and you can get a mild to moderate spinal meningitis, as well as paralysis of the seventh or facial nerve, and a few actually the first symptom was the Lyme arthritis, which is actually late stage, which means they were probably bitten several months earlier. And I think only one in that series actually had involvement of the heart. So that was the complete symptoms that were seen in children. But that was a breakup. So I think that was very instructional for pediatricians. SOODIf you're looking for the rash, you will probably find it in 90 percent of cases. AUCOTTI think that's generally true, although there may be referral biases because since the rash is the easiest thing to see, those are the patients that get diagnosed. We routinely see people that never develop a rash and get delayed or misdiagnosis for many months and really don't present until that third stage, with joint swelling and arthritis. So, you know, the rash is the key thing, and I want to emphasize it's not usually that ring-within-a-ring target that people are looking for. AUCOTTIt's usually uniformly round and red, and people often miss the chance to make the early diagnosis because they say, well, it doesn't look like the target on a Target department store, it's just red, it must just be a bug bite, and that's a lost opportunity to make the diagnosis. REHMAll right, and joining us now, Dr. Neil Spector. He's author of the book titled "Gone In A Heartbeat: A Physician's Search For True Healing." He is associate professor for the Departments of Medicine and Pharmacology and Cancer Biology at the Duke University School of Medicine. Dr. Spector, tell us about your symptoms and how doctors treated them. DR. NEIL SPECTORSure. Well, first of all thank you, Diane, for having me on. It's a pleasure to be here. SPECTORSo my symptoms were very different from what's been described, and I certainly appreciate Dr. Aucott mentioning, you know, that -- I've been in medicine for 25-plus years in oncology. There's very few things that are algorithmic and written in stone. You know, we're each individuals in our bodies, and it's not only the tick, it's the host, as well. SPECTORSo my symptoms started, I was the paradigm of health. I ran two Boston Marathons. I used to run 10 to 12 miles six days a week. You know, I had no family history of heart disease or really anything other -- other significant illnesses for that matter. And I started the first symptoms -- so my wife and I moved from Boston to Miami, I took a job at the University of Miami and set up their bone marrow transplant program. And probably within a short period of time, the first episode I had was of this literally brain fog, where I felt as if I had taken about 50 Benadryl. SPECTORAnd in fact I gave a lecture, and it just came on out of the blue. I gave a lecture in a molecular biology department, and I remember walking out, and somebody said, but, you know, it's really interesting research, and I had very little recollection of what I had just spoken about. And that lasted for probably about two weeks, and as mysteriously as it came on, it just resolved spontaneously. SPECTORI was worked up. I had a slew of blood tests. I had a slew of scans, and really nothing in particular. They were just typical blood tests, you know, CBC, your blood count, your chemistry. SPECTORAnd so I was told I was probably stressed from moving, I was writing grants, I was attending on a transplant service. And then I started having -- I then had an episode of what I for all the world felt like a textbook -- like a heart attack. I was driving. I started having, you know, this chest pain, and it just crescendoed as if, you know, the classic elephant sitting on my chest. I started sweating profusely. I felt nauseated and managed to pull into an emergency room, and by the time I pulled in, my symptoms had resolved. SPECTORAnd again I was told I was stressed. I had EKGs. I had, you know, somewhat of a workup. SPECTORAnd I then developed, for the ensuing four years, palpitations, so intermittent, very rapid heartbeat, 200, 250 beats a minute, that might last 25 seconds, 30 seconds at most. Again, I, you know, went from running marathons to probably being able to write a book on every emergency room in South Florida, which is pretty typical. REHMAnd I gather you finally realized it could be Lyme disease. Why did you decide to test for that? SPECTORWell, what happened was later in the course, I developed arthritis, just out of the blue, severe arthritis, and I was given doxycycline for completely independent reason, and within 24 hours of taking the doxycycline, the arthritis resolved. And so I started piecing together the fact that here I was a healthy individual, I was having what I knew, although they were never documented up until I was finally diagnosed, and this went on from '93 to '97, I knew that the palpitations I was having were not normal. I mean, people have palpitations. SPECTORAnd so I thought, you know, I'm having cardiac symptoms, I have arthritis that resolves with doxycycline. I was told, by the way, at the time that the doxycycline response was a non-specific anti-inflammatory effect of that class of antibiotics. And so I was tested. So I requested being tested. I requested that the test be sent to a Northeastern laboratory, and they were waiting. SPECTORSo I might add that in '97, I developed full-blown heart block, so third-degree heart block, and I was having intermittent episodes probably of second-degree heart block, which to your listeners doesn't mean that my coronary arteries were blocked, it means that the electrical system in my heart was not conducing the impulse normally, again one of the manifestations, albeit perhaps not that frequent, but of Lyme disease. SPECTORAnd so in June of 1997, I had a heart rate of 40, which I knew wasn't normal because at that point I was so fatigued that I could barely walk 50 yards without having to stop. REHMAnd ultimately I gather you needed a heart transplant. SPECTORI did, I did. So I was treated in 1997 with three months of intravenous antibiotics. REHMSo you attribute all of this to Lyme disease? REHMYeah, all right. And I'm going to follow your comments with an email from Beth, who says please discuss those with Lyme disease who were not diagnosed until years after the tick bite, which certainly sounds like you, Dr. Spector, and never received an early regimen of doxycycline. The conversation so often centers around people who do receive early treatment and are still sick rather than the majority of us who have been sick for years and never knew we were bitten so got no early treatment. Dr. Sood, what's your reaction? Do you think this late-term introduction of Lyme disease as a cause can be really rather widespread? SOODSo let me start by saying that again, among the hundreds of types of infections I treat in children, and again I'm going to focus in general on the excellent prognosis of Lyme disease in children, I like treating Lyme disease because it is a bacterium that is one of the easiest ones to treat. It's very easy to kill with a single, relatively short course, which, you know, can go up to four weeks if you have arthritis, of antibiotics. And it does not become resistant. And it's really been shown, again and again, it really doesn't persist in the body, although sometimes you can get it again from a new exposure from a future tick bite. SOODBut we have to keep in mind that each person is basically genetically different, and we all react very differently to an illness. SOODBoth in terms of the body's response, as well as the mind's response. That illness could be an infection, not only Lyme disease because we see this with other infections, or an injury or an illness or a traumatic event. And so some of us may have persistent symptoms after having Lyme disease for sure. What we know for certain is that the persistent symptoms are not due to persistence of the Lyme disease bacterium in the body, simply because it does not persist in the body a long time, except with the exception of arthritis, and even at that last stage you can eradicate it. SOODBut these individuals need a prolonged course of treatment. It's just not prolonged antibiotics. And of course we know that there are missed cases, as may have happened in Dr. Spector's case. But I -- after listening to his fascinating story, and I'm glad everything turned out so well in the end, I may want to, you know, involve Dr. Aucott in this discussion because he is, I know, actively studying the genetic -- the variation, I guess, in the genetic makeup of people that makes people react different. SPECTORCould there have been a different sort of a genetic makeup that caused Dr. Spector to -- his heart to react in that way? REHMAll right, and you're listening to the Diane Rehm Show. Dr. Aucott, I know that this kind of long-term, chronic illness is controversial in the medical profession as it relates specifically to Lyme disease. Why is that? AUCOTTWell, I think a big part of it is due to our lack of the ability to have direct measurement tests for the infection. Unfortunately, we're still relying on what are called serologic tests, which measures the immune system response to the infection. And we don't have a direct measure of the actual infection. So this becomes a problem because in the first two weeks of infection, you haven't mounted an immune response. So those immune-based serologic tests don't work in the first few weeks of infection. AUCOTTThey tend to work later on better, but you've missed that opportunity in the first two weeks, when you want to treat it. So that's one big problem. The other problem is, as Dr. Spector's case points out, sometimes even in late stages when you have tissue to look for the infection, we don't even really have adequate tools to look for the bacteria in tissue often. So I'd be interested whether on his heart transplant, whether they looking for Borrelia organisms in the heart that was removed. That's actually more difficult than it sounds. AUCOTTUnlike other infections where we can do PCR tests and special staining, these kind of tests haven't been developed well yet for Borrelia infections. REHMThat's very interesting. Dr. Spector, can you respond? REHMYeah, quickly because we're almost out of time before a break. SPECTORSure, I just want to -- so one, there was fibrosis in the heart. There wasn't evidence. And I'm not sure they were specifically using the sensitive tests that perhaps aren't even available. The other thing is that there is pre-clinical evidence that the bacteria actually does persist in animals. And we now know that there are different forms of the bacteria that are more resistant to the classic doxycycline antibiotics that need to be, you know, that need to be utilized. SPECTORAnd, you know, there's work at Dr. Aucott's institution looking at these persistors in different ways to try to attack those resistant form. So this isn't really a one-size-fits-all disease. I think for me it's a lot like cancer, and I completely agree with what's been said, that we need much more money spend on research into this disease. REHMAnd Dr. Spector, briefly, why did you want to write your book? SPECTORI wanted to write my book, one, because I realized that there were other people out there who are suffering, and there's a lot more that we don't know than we know about this disease and that there are people who don't fit the classic mold of a bull's-eye rash and a tick bite and that I'm an example of somebody who is a physician scientist who was dismissed as being stressed when in fact I had a serious, life-threatening infection that almost took my life. REHMWell, Dr. Spector, I'm glad it did not. I'm glad you've been with us. I wish you extended good health. Dr. Neil Spector, his book is titled "Gone In A Heartbeat." Short break. We'll be right back. REHMAnd welcome back. I was just asking about dogs and Lyme disease. Dr. Aucott, say a little about that. AUCOTTSo, dogs and horses are affected by Lyme disease. Often, there are certain breeds of dogs that actually get renal failure with Lyme disease, so it depends on the breed. So, it's a big problem in dogs and horses. REHMWell, suppose a dog has been bitten by one of these ticks. The tick has been removed and the dog has not been treated with antibiotics and months go by. Does it make sense to treat with antibiotics later? AUCOTTOf course. Yes. Absolutely. Veterinarians are very good, usually, about testing for Lyme disease. And there is a vaccine for Lyme disease in dogs, not in humans. So, dogs also have the opportunity to get the vaccine. REHMThat is just fascinating. Here's an email from Robert, who says how does Lyme disease differ from Rocky Mountain Spotted Fever? Dr. Roepe. ROEPEWell, they are very different diseases, but they're both carried by ticks. The species of tick that tends to carry the Rickettsia bacterium is a different species. Although, there is some recent research that shows the Ixodes ticks that carry Borrelia that cause Lyme disease, can also sometimes carry Rickettsia. So, it's extremely rare, but it is, in theory, possible to get infected with both at the same time. But typically, Rocky Mountain Spotted Fever is caused by Rickettsia infection that's due to a bite from a different species of tick. REHMAll right, let's go to Katy in Rockville, Maryland. You're on the air. KATYHi there. Thanks for taking my call. KATYMy story is very similar to Neil Spector's. It's very recent, though. I had, three years ago, symptoms very similar to arthritis and was diagnosed with an arthritis like condition and treated for that. Then, this winter, I was diagnosed with Lyme. I never really felt better after that treatment. And that turned into very significant cardiac issues. I did have heart block and had to have a pacemaker implanted. And I'm curious, and hearing Neil's story makes me even more curious, do I need to continue to worry about the progression of the disease, particularly as it relates to my cardiac function? AUCOTTThe cardiac illness is quite serious, but fortunately, with antibiotics, almost always, not always, but almost always, the cardiac part of the disease subsides and does not become a progressive illness. There are some people that have remaining symptoms, however, such as fatigue and achiness and palpitations. And those symptoms can persist, and that's what's called post treatment Lyme disease Syndrome. But the actual heart damage tends to be stopped with the antibiotics. AUCOTTIn Dr. Spector's case though, of course, it sounds like it may have gone on, the damage, for years. And that's why the damage was irreversible and as he mentioned, he had fibrosis. So, a lot of it depends on how quickly it's treated. REHMAll right. Here's an email from Will who identifies himself as a reporter for Newsday on Long Island. He says, on eastern Long Island, Lyme disease is a major public policy issue. The debate almost always focuses on the deer, not ticks. Municipalities went so far as to hire US Department of Agriculture sharpshooters in 2013 to cull deer in Suffolk County. Though the program proved ineffective. Do your panelists see deer population control as an effective way to reduce the incidents of Lyme disease? Dr. Roepe. ROEPEThat's a really interesting question. In theory, it should help. And I've seen data on both sides of that issue. But you have to go back to the life cycle of the tick, which is a bit more complicated than just living on deer verses biting humans. It actually involves rodents and even other mammals. Even, so, in theory, if you have the main animal in which the nymph is going to develop is actually a mouse. There's a couple different species of mice, but the nymphs that are going to give you Lyme disease are growing on the ears of mice. ROEPEAnd then, as the colder weather approaches, in the fall, the ticks jump to the deer. But they can jump to other animals, too. They can jump to dogs. They can jump to other larger animals, and so it's a bit more complicated than just getting rid of the deer. You really want to concentrate on getting rid of the mice, I think. That's probably a better animal control strategy. REHMInteresting. All right, let's go to Tom in Akron, Ohio. You're on the air. TOMHi, I was bit by a tick last, at the end of May, and I was up at Allegheny, and just short of New York, just down from New York. And I came back and got a prophylaxis of some kind of antibiotic, 200 milligrams of it. And I was reading in, I forget what it was, how to outwit ticks. There was a vaccine for humans. And I heard one of your guests say that there is none. But I was -- I found it easier to get vaccinated for diseases in Africa and Asia than I could get vaccinated for Lyme disease. AUCOTTSo, there was a vaccine approved for human use and it was withdrawn from the market several years ago. AUCOTTBecause of allegations of side effects. REHMWhat kinds of side effects? AUCOTTAnd actually, the symptoms kind of overlapped with Lyme disease, which made the allegations difficult to prove or disprove. REHMDr. Sood, I know you wanted to jump in. SOODWell, two things. Maybe I can chime in on, yes, and we were actually part of the pediatric studies of Lyme disease vaccine. I have to say, it was a very, actually, there were two companies sponsoring those studies, and it was a very effective vaccine. The pediatric study was actually done in Suffolk County, where Will is from. And it was very effective, so it was a disappointment to us. And again, it is actually for pediatricians and for the field of pediatric vaccines. Sort of a cautionary tale where sometimes misinformed activism can torpedo a perfectly good vaccine. SOODI think that's really what happened in this case. So anyway, we're waiting for, you know, maybe a broader vaccine that would actually be developed for both the American and European species of Lyme disease that Dr. Roepe mentioned. And if I could just add too, there is some evidence, actually, from this famous experiment done on Mohegan Island in Maine, where they actually did a study to eradicate the deer and they showed that they actually could eradicate the persistence of the bacteria in the rodents there. SOODSo, if you break one major part of this life cycle of the deer tick, you may be able to eliminate Lyme disease from that area, but again, it's not practical, because again, the reservoir of the bacteria is in these rodents that were mentioned. REHMDr. Rood, I'd be interested in your response to what happened to Dr. Spector and finding this late reaction to what he believes was a Lyme disease carrying tick. SOODI'm sorry, is that for me? REHMYes, that's for you, Dr. Sood. Yeah. SOODPerfect. Okay. Thanks. Sorry. Yeah, so, again, what I was trying to bring out is, is it possible that there was, say, another, you know, coincident cardiac condition that predisposed Dr. Spector to getting the complications of what seems like was truly a Lyme disease infection that was not diagnosed for several years. Because that was, you know, the proof of that is in that he had what seems like Lyme arthritis. And that responded to the doxycycline. So, it is difficult to really say, but there are some reports, case reports from Europe. SOODWhere the condition that Dr. Spector was referring to at the end, toward just before he got his transplant, the dilated cardiomyopathy. That the Borrelia could be in the myocardium. That means the heart muscle tissue. And would need to be treated with antibiotics. So, but again, as, I think, as we've all pointed out, that seems to be a rare case. REHMBut let's talk about how doctors deal with someone who comes in and says, you know, I may have been bitten by a tick. I'm not showing that bull's-eye, but I feel as though all of a sudden, I've got terrible arthritis. I can barely walk. I mean, do doctors have a complete understanding of when to treat and when not to treat? Dr. Roepe. REHMIsn't it safer to treat rather than not to treat? ROEPEWell, we have such a huge and growing problem with antibiotic resistance in this country that is really at the forefront, I think, and really in the minds of every physician out there. So, overuse of antibiotics. I mean, it's estimated that 50, 60 percent of the antibiotics in this country are not being used properly in the first place. So, I think physicians have to be, are certainly becoming increasingly more cautious with their antibiotic use. So, so you can't, you can't treat, you can't treat symptoms. You have to treat a disease. ROEPEYou have to know what the disease is, so the careful physician has to have confirmation that the person has a Borrelia infection. And then prescribes the antibiotics that are going to be relevant to that infection. REHMBut there's no blood test for this infection? ROEPENo, that's the real, I mean, we have tests for your antibodies, for your immune system's reaction to the bacterium, but we don't test, initially for the presence of the bacteria. And worse yet, well, to make it more complicated, there are many other microbes that can be carried by these ticks, and you can -- that can give you an infection and that can also give you a disease with very similar symptoms, at least earlier on. So, other bacteria that you might not want to treat with doxycycline. REHMBut Dr. Aucott, you're giving patients a choice. AUCOTTWell, I was -- I think the patient has to be involved in the discussion. AUCOTTEspecially when you get to -- so one of the big gaps here is when you treat somebody with Lyme disease, you don't have a follow up test of cure. So, unlike other situations where, if you have malaria and you treat it, you do a smear and you see whether the malaria responded to the treatment. We don't have that for Lyme disease, so it becomes a situation where the patient comes back to you and says, well, am I cured? And all we're left with is, well, do you feel better? Well, that's no way to practice medicine. AUCOTTYou know, we need to develop tests of cure. Like an oncologist gives you chemotherapy, they repeat the scan to see if your tumor responded. If you have malaria, they repeat the smear to see if the malaria responded. We don't have that in Lyme disease. There's no test of cure, and so patients that remain symptomatic are left in this quandary, well, why am I still symptomatic? REHMSo, here's a caller in Ann Arbor, Michigan, with something of the same question. Go ahead, Chelsea. CHELSEAHi. I think you guys already touched on this a little bit, but I was kind of curious. When you come in with like ambiguous neurological symptoms, and sometimes that's fatigue and brain fog, how do you differentiate between multiple sclerosis or, and Lyme disease? When you're maybe negative on both tests from the spinal tap? AUCOTTSo, that's an example where it would be wonderful to have better measurement tools for Lyme disease. Because we don't have those. Now, for MS, we do have scans, and if the scans, like an MRI scan are characteristic for multiple sclerosis, that's very important data that would, for bringing in the diagnosis of MS. But if the scans aren't conclusive, then, you're right, sometimes you end up in this gray area where it's hard to know. That's more common in Europe, where neurologic Lyme disease is more common than in North America. REHMAnd you're listening to "The Diane Rehm Show." Dr. Sood, what are your thoughts on chronic Lyme disease? Do you believe that there is science to support it? SOODSo, personally, I try not to use the word chronic Lyme disease, because that does connote that the infection has been proven to be present chronically in the body. And there's very little, yes, there's evidence in animal studies, but really animals' immune systems, especially the small animals, like rodents, that these have been shown in, are very different from the human immune system. And so, right at the top of your show, I think that you had mentioned that this, you know, the outcome of Lyme disease is a controversial topic in the medical community. SOODI really don't think it should be, if we pay attention to the scientific studies, and if we are able to sort out the good science from, and frankly, there is bad science also published in the literature. That's easily accessible now, on the internet, to lay people. And so, if the first thing that comes up when you do a search online is the bad science, then that would perpetuate the myth. Now, we completely agree that there are persons like I said earlier, who react differently to illness. SOODTo infection and to Lyme disease. Now, we, I think we are at fault. We physicians need to spend more time and effort in looking at these individuals' particular problem, listening, spending time, listening to them, and finding ways to alleviate these persons chronic symptoms, which often are proven by blood tests, by the same serological test that Dr. Aucott mentioned, that actually show that this person has never -- the person's body has never met the bacterium. They may not even have ever had a tick bite, or even lived in an area where they could get Lyme disease. SOODYet, they've been given a diagnosis, a wrong diagnosis of Lyme disease. And meanwhile, we should be looking for another reason to help these people. SOODBecause they need treatment. Just not antibiotic treatment. REHMDr. Aucott. Dr. Aucott, do you believe there is such a thing as chronic Lyme disease? AUCOTTYeah, I think chronic Lyme disease is a broad term, like saying hepatitis or cancer or fatigue. It's not specific enough. I think what we'll find as we unwrap this term, chronic Lyme disease, is that it encompasses very different, specific diagnoses. For instance, late Lyme arthritis, that was the illness that led to the discovery of Lyme disease, is a form of untreated chronic Lyme disease, defined by positive PCR tests on the joint fluid of arthritis. AUCOTTSo, that would be a sub-category under chronic Lyme disease. There's the area I study, which is called post treatment Lyme disease Syndrome. And I'll say that that's now, I think, we know is a real illness. And how do we know it is is because we're understanding now and discovering markers of altered immune system function in those patients. So, I agree that people react differently, and one way they react differently is their immune system. So, Dr. Alan Steers published a paper recently, and we have one in review now that shows specific immune biomarkers that are altered in that sub-group of patients with post treatment Lyme disease Syndrome. AUCOTTAnd then there's other groups that we'll unpackage as time goes on. REHMSo, you're calling it post treatment chronic, but you're not calling it chronic Lyme disease? AUCOTTNo, because I think that umbrella term carries too many connotations and it's too charged. And honestly, there's a rule in medicine. The splitters always win. Hepatitis, 30 years ago, was five different viruses. Now we know that. The splitters, when you define things, always win. REHMAll right, we'll have to leave it at that. Don't forget, if you want to have your questions answered by Dr. John Aucott, he is staying on with us. You can post your questions at Facebook.com/thedianerehmshow. And thank you all so much.